Grim Fandango has returned! Originally developed by Lucas Arts and released in 1998, Double Fine, makers of great games like Brutal Legend, The Cave and Broken Age, have remastered this classic for a new generation. For me, this will be my first encounter with the game, having not played the original so I am able to see it through fresh eyes. Having listened to a few of my usual gaming pod casts, while I trudge along unwillingly in my day job, it has come quite apparent to me how much people love this game and why so many are excited to see its remastered return. We are presented with our controllable protagonist Manny Calavera. He’s what is known as a travel agent in the land of the dead. It’s his job to see that the recently departed find their way to the eternal resting place depending on how well they lived when they weren’t walking skeletons. We find out that, for reasons not yet explained to us, he is working as a ‘Travel Agent Grim Reaper’ to pay of a debt. Try as he might, however, it doesn’t seem to be working all that well. By no fault of his own it seems that he just isn’t getting the saintly clientèle that he deserves and this has something to do with the company he’s working for. As I booted up the game, even though I haven’t played Grim Fandango before, I was immediately hit in the face with nostalgia. I grew up playing point and click PC games such as Discworld and Sam & Max with my dad and brother. This game brought back that feeling and I immediately settled into my chair for my nostalgia journey, I was going to be here a while. There’s one thing in particular that these games do more than others in my opinion and that’s bring you into a world that feels alive, ironically for this game especially! 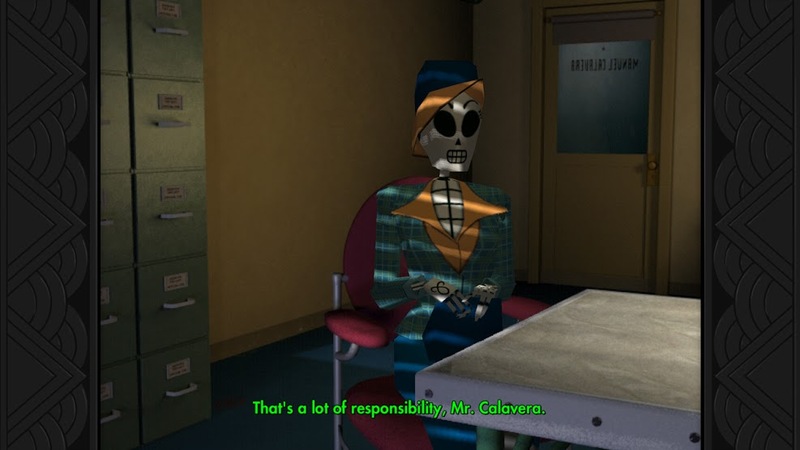 Grim Fandango is no different. It feels like I’ve stepped into a modern city filled with Mexican folklore and mystery. The characters also greatly add to the ambiance of the game as well. 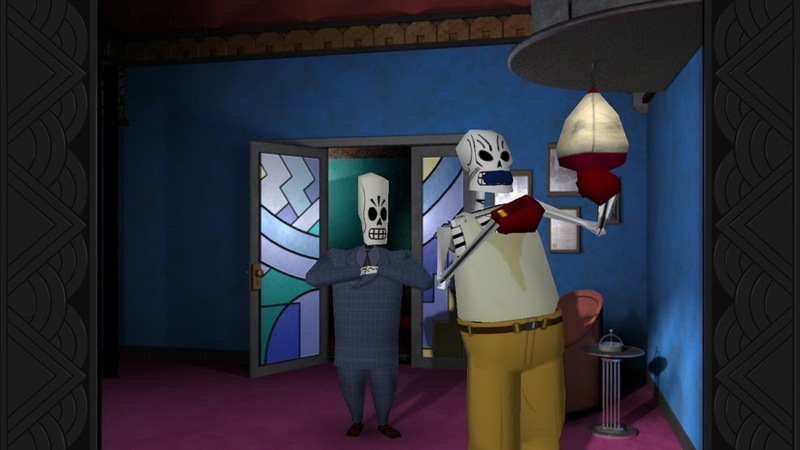 Just like in Discworld, Grim Fandango’s story brings forth characters with personalities and traits that make you laugh or hate them instantly, from the sarcastic, job loathing secretary, to the stuck up, pompous, big headed douche that is Domino, our quickly established rival in the game. 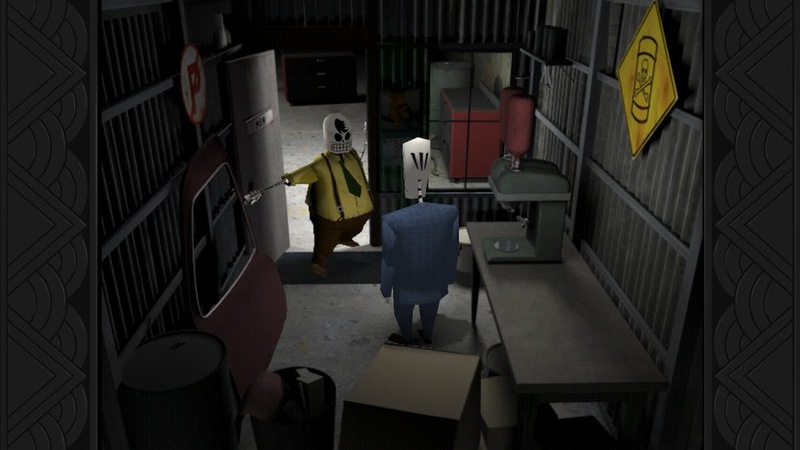 Our protagonist, Manny, is a engaging funny skeleton in a suit that, like myself, works because he has to, puts up with his colleagues because he has no choice and finds himself wanting to take that extra step cause he wants to get out of said job and out of the land of the dead…..Really hits home for me! Controls are extremely simple, click on an item of interest, look at it, interact with it or pick it up if you can do. It’s often worth clicking on everything you can and clicking on the eye symbol just to hear what Manny will come out with, or trying to pick things up such as the large computer in his office to hear him say “it’s not portable.”. Little comments like that allow us to go through the usual task of clicking on everything and seeing what happens in times of confusion, but also keeps the game interesting. I also love these games for the fact that they break the fourth wall. Our main characters are the only ones, most of the time, that remind us that we’re playing a game and some of the things we end up doing when stuck is ask our buddy to perform the ridiculous. When I was younger I used to click on anything just to hear Rincewind from Discworld or Max from Sam & Max say something funny on repeat. Sadly I did have one issue while playing this game and, while its only a small gripe, it’s something I feel that newcomers such as myself might also have an issue with. I’ve played these point and click games growing up and the pacing is often helpful in building the feel for the world you’re in. While I know the setting we find ourselves in is supposed to feel huge, I can’t help but wonder if some of the areas in the game are too big for Manny to stroll through and still keep the player interested. It’s not so much of a major problem but when I had to walk to the garage or the opening to the petrified woods, I found myself with plenty of time to sip my brew and check my phone. That was until I discovered that by pressing shift Manny could run to wherever you wanted him too, but the maps can still sometimes feel too large. I’m a patient guy but I cant help but wonder how a younger audience might find the slow and steady pace, in a world filled with fast paced first person shooters….Call of Duty I’m looking in your direction! I’m absolutely loving everything this game has placed in front of me so far. The setting, the characters, Manny’s engaging personality, even though he’s a walking corpse, the simple yet clever puzzles and I am in love with celebration of Day of The Dead festival that goes on in Mexico that this game is based around and inspired by. While we’re on the subject I can say that; if you plan to visit Mexico, go when this festival is on, its well worth experiencing. As I’ve said the only downside I can think of is the games pace. It isnt too much of an issue for me, this is the kind of game I grew up on. I do recommend that if you’re a little younger and missed out on the type of game this is, then be prepared to sit down and take in the game and the world you’ll find yourself exploring and become familiar with. If you’re patient, you’re experience with Grim Fandango with be one to remember. 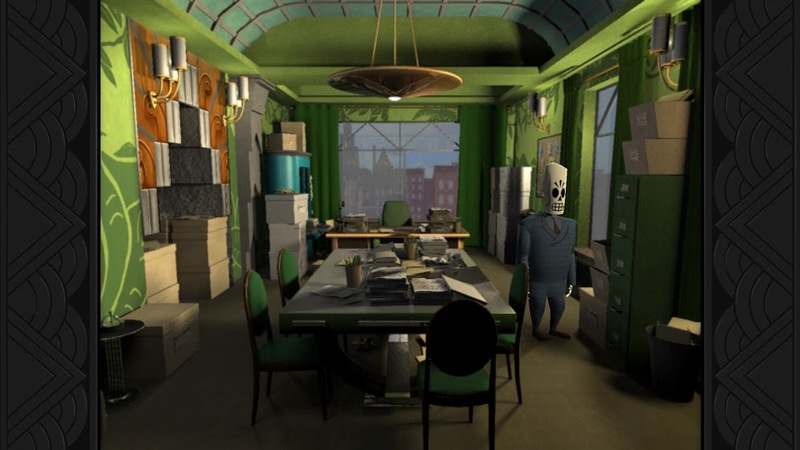 This entry was posted in Uncategorized and tagged Double Fine, Grim Fandango, Lucas Arts, PC, PS4. Bookmark the permalink.